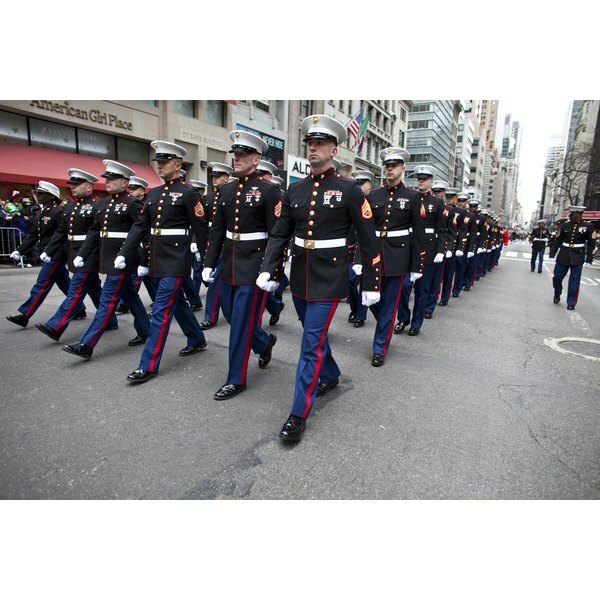 Of all of the U.S. military dress uniforms, the Marine Corps dress blue uniform is perhaps the most distinctive. A dress blue uniform is worn for specific events on base, such as balls and weddings, and for specific ceremonies in town. The trademark of the dress blue uniform is the high closed-neck collar. It is the contemporary version of the leather collar worn by Marines in the 18th and 19th centuries. It was intended to block the blow of a saber during shipboard combat. This collar gave the Marines the nickname "leatherneck," which they are still called today. If your uniform is not already fitted, take it to a military tailor to have it altered to a form fit. The dress blues aren't to be worn with any slack whatsoever, according to Marine Corps uniform regulations. The tailor will also mount and sew on your rank insignias. A Marine is not permitted to sew the insignias on himself. Put on the trousers, and run the belt through all seven belt loops, from left to right. The belt buckle should be clasped tight and centered in line with the trouser button. Fasten the remainder of the belt back through the first loop on the left, and make sure it doesn't go more than 2 inches beyond the loop. The dress blue blouse should be worn with every button clasped and centered down the body in line with the belt buckle. The blouse should be free of lint and loose strings along the seams. Place the white belt around the waist an inch above the hip pocket seam. This belt is worn around the blouse and has no loops to secure it. Ensure that the belt is clasped at dead center, in line with the buttons of the blouse. Note that this belt is worn for ceremonial occasions, normally for military-only events, and is typically used with the Marine Corps sword and white gloves. Ribbons--symbolizing medals--are to be worn with the "B" dress uniform. For the "A" uniform, medals are worn in lieu of ribbons. The "A" uniform is worn for ceremonies on base and cannot be worn during leave or liberty. The ribbons are centered over the left breast, a half inch above the top seam of the left breast pocket. Only a military tailor can pin on the medals worn with the A uniform. Wear any rank insignias, such as parachutist or scuba diver, centered 1/8 inch above the ribbons on the left of breast. If you are a noncommissioned officer, wear two gold Marine Corps insignias--eagle, globe and anchor pins--on the left and right sides of the collar, spaced 2 inches apart. Officers wear gold and silver insignias in the same manner. 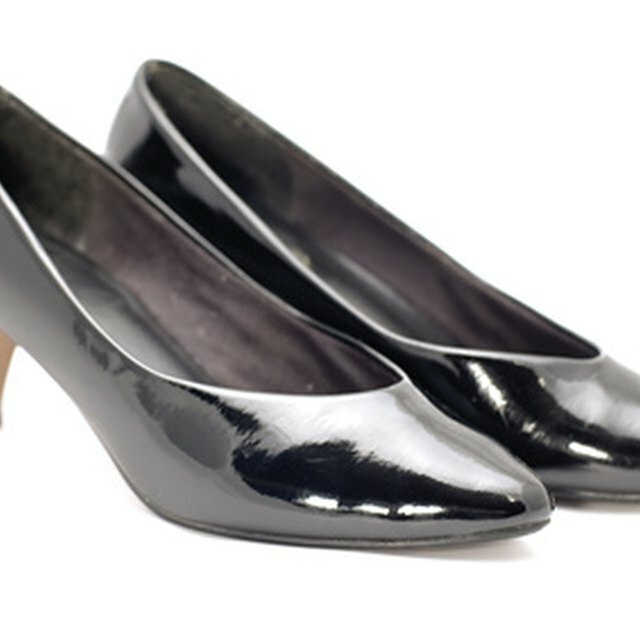 Wear highly polished black dress shoes with black dress socks. Wear the white Marine Corps cover squarely on the head, with the brim seated a half inch over the brow line. Do not wear white gloves unless you are performing a ceremony or are stationed in Washington D.C. for presidential and cabinet detail. Only wear the Marine Corps sword and scabbard when performing special ceremonies or instructed to do so by a commanding officer. Never wear rank, medals, ribbons or insignias that you do not rate or have not achieved. This is a direct violation of Marine Corps uniform regulations and the code of conduct. What Is the Difference Between Air Force Formal Dress & Mess Dress?